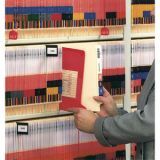 Large pocket holds documents to be filed. Bottom tab printed OUT on both sides. 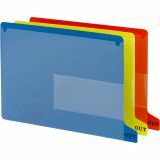 Smead Colored Poly Out Guides with Pockets, Poly, Letter, Red, 25/Box - Clearly mark where folders have been removed from your shelf filing system with these end-tab out guides. 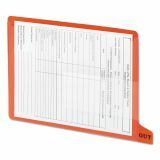 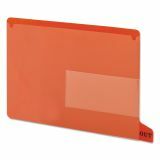 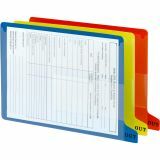 Small translucent pocket holds charge-out form indicating file taken, date taken and by whom, while the larger pocket temporarily holds full-size documents to be filed in the folder when it is returned. 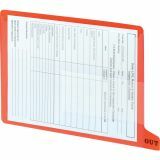 Tabs in 1/5-cut bottom position are embossed with the word, OUT." 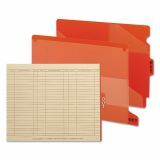 Letter-size out guides are made of 20 point poly material that is acid-free and archival quality."